We are excited to announce that we have 31 new geometry assessment item progressions for high school. These new assessment items have been optimized to allow teachers to design instruction that encourages rich mathematical discourse. They also include model student responses that show the myriad approaches students can take to show and justify their thinking at DOK levels 1–3. True rigor is pairing mathematics with real-world challenges. Geometry is the perfect subject for developing and applying critical thinking skills through real-world problem solving. In the example above, students must use geometry to tackle a challenge around urban planning. It marries the observable and the theoretical in such a way that students can make relevant connections between geometry and their own lives, aspirations, and college or career goals. The goal of these assessment items is not to simply help students meet the standards; the goal is for students to develop habits of mind that push them to apply subject specific knowledge and skills to their own lives in a critical manner. Students are able to come up with mathematical solutions to address problems that actually matter to them. The algorithms associated with the real-world problems are critical in terms of meeting the standard, but those algorithms become less important when students are engaging in conversations about using math to impact humanitarian issues. The mathematical conversations that students are engaging in are grounded in real-world consequences that are open for interpretation and debate. The new geometry assessment items explicitly focus on domain-specific language and vocabulary that students must internalize if they are to successfully engage in rich mathematical discourse. The justifications in the model student response section incorporate vocabulary that helps teachers take into consideration all of the skills and knowledge students need to be successful. It also incorporates the vocabulary in a way that reveals how to use it contextually. Pairing this language focus with geometry, which is a mathematical domain that is largely concerned with visualizing math, helps teachers develop a culture of mathematical thinking that is driven by discourse. Model student response that pairs domain-specific vocabulary with a student-drawn model. 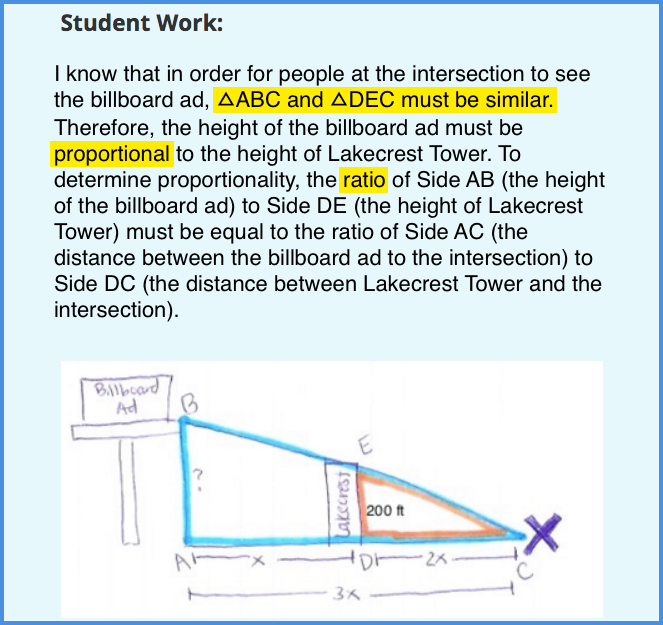 The model student response above shows how students must determine the optimal height of a billboard by applying their knowledge about triangle congruence and similarity. They then have to justify the processes they applied to reach their conclusions in writing using specific vocabulary. This example incorporates the domain vocabulary of “proportional”, “ratio”, and “similar” in context so that teachers can help students move beyond simply memorizing words to internalizing a new academic language. The DOK 1 item simply requires students to calculate for a triangle’s missing side length by using side length proportions. At this level, proficiency with applying an algorithm is the level of mastery students should reach. The DOK 3 item requires students to apply their knowledge and skills to a real-world problem. 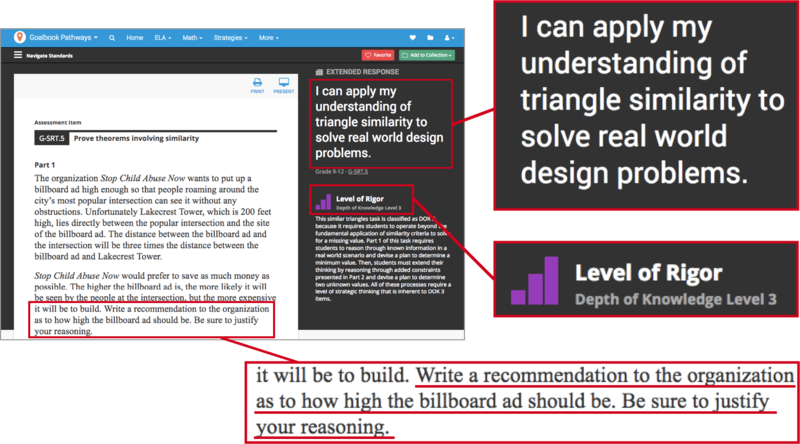 At this level, students should be designing solutions using algorithms to support their critical thinking. Students must rely on the ability to infer and hypothesize as they decide on the best solutions. Ultimately, these new progressions help teachers encourage discourse and visual thinking as tools for mathematical problem solving. Our hope is that these progressions will be useful as teachers increase the rigor in their instructional design.